Hi all, apologies for just registered up and immediately asking your help I didn't know where else to turn for such a specialist lens! Basically, I sold an MPE-65 on eBay, the buyer received the lens and stated that he didn't think the condition matched what was advertised and then tried it on his camera to find it had err01. He then said he spent over an hour cleaning the lens before deciding to send it back to me for a full refund. 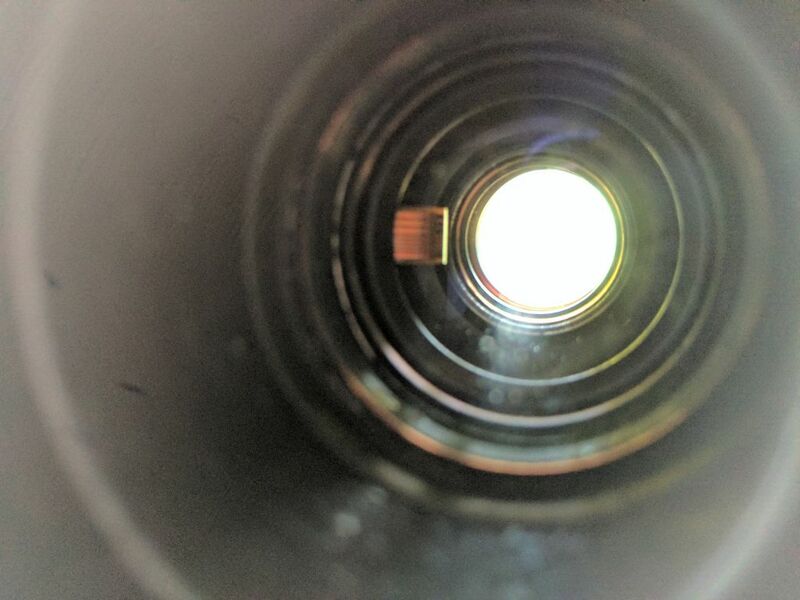 Is there a ribbon cable that you can see internally in the lens? I noticed when inspecting that there's a cable inside and it may be evidence he's tampered with it as I can't take the lens apart to check as obviously I'd then be interfering myself. I've attached a photo to show the cable, if someone wouldn't mind checking for me? Also, I've included a video of how the lens has been sent back to me. What are your opinions? I may link the eBay case to here as some kind of proof? Henley, welcome aboard! Sorry to hear about your difficulties! No concerns about linking here from anywhere else. The forum is open for reading by the public. Only registered & approved members can post. I presume my MP-E 65 has a ribbon cable inside it, but the cable is not visible, at any position of the magnification/focus ring. For your video, I'm not getting any sound so I have not much idea what I'm looking at. I have read of a ribbon cable which eventually can need replacing, but I don't know if it "pops out". I can't see the video properly. Very sadly, I fear ebay will not help you - it's a nasty place to trade. Surely your original ebay listing contained good photos of the lens from many angles? iff you can, look at your original ebay posting and check serial number to the one you received back. buyer could if the same lens, report that goods were damaged in transit. i feel that ebay would not be much help otherwise. The lens casing is the same as I've inspected very minor imperfections that show it's the same on the outside. Parts may have been harvested internally or swapped over, I don't know on that side of things. I took various high res photos for any bidders to inspect the lens and he bought it despite seeing the condition. If he wasn't happy when he received it he could have just fired me a quick message and I'd have happily taken a return (which is actually how I got it back in the first place). He expressed he wasn't happy and that's fine, sometimes people have different opinions or things that are important to them, I'd take it back and re-sell and take the postage hit, that's life. I have 100% rating that i'd like to keep too. But on receipt of the lens it quickly was clear it wasn't a case of the lens just not being right for him, he's heavily interfered with the lens to the point it no longer works and is mechanically different. This isn't something that could happen in shipping either, he's already said he cleaned it for over an hour with a lens brush (how can cleaning a lens take over an hour with a lens brush)?! I suspect he may have one of his own which was broken and he needed something from it to fix it or he decided to do some maintenance for whatever reason (he said the 'zooming' movement wasn't up to scratch) so he might have decided to take it apart and damaged it in the process and freaked out and decided he didn't want to pay for his mistakes. Thanks for your replies and advice, it's appreciated! If anyone has an MPE-65 can then have a quick peek to see if the cable can be seen when looking through the lens when it's off the camera? Wouldn't your eBay photos of the lens show the presence or absence of that cable? any chance of posting your original photos? You may already know this, but the repair cost of the ribbon problem can run between $300-$400 U.S. This is assuming that this is the only problem here. If anyone has an MPE-65 can then have a quick peek to see if the cable can be seen when looking through the lens when it's off the camera? That was off the camera, looking from both ends. I checked my own MP-E and I can verify that, looking through either end of the lens, I cannot see the ribbon cable protruding as shown in the photo, which doesn't seem normal to me. Clearly, the purpose of the ribbon cable is to facilitate electronic control of the iris, the physical position of which extends with the front of the lens. After reviewing the parts catalog for this lens, the ribbon cable you're seeing actually is not very long. It certainly doesn't look like it should bend so sharply inside the lens. Purely speculating here, but it is plausible that the buyer of the lens disassembled it, and reassembled it improperly. It seems unlikely to me that the cable could be dislodged through transport. Usually, a properly designed modern lens will have the supporting electronic components (cables, AF motors, PCBs) located outside of the sub-barrel assembly to prevent these from entering the optical path. This is certainly the case for the MP-E. The fact that you characterize the barrel's movement as "sloppy" and "loose" suggests the lens was either dropped or tampered with, but if it had been dropped it would most likely show clear signs of physical damage and it's more usual to see the barrel movement become impinged or tight, not loose. Again, surely your own high-res photos of the lens taken prior to shipping would show the presence or absence of this cable. I am following with curiosity. I wish you recover your loss asap.